It’s late Friday evening and my fourth day back on the snow is over. Starting to get a bit tired and my knee is swelling up a bit in the area just above the kneecap. It’s a bit soft and pudgy, so there is some fluid there but it’s not hurting so no big deal. I was getting tired up there today though. My exploration of this amazing mountain continues. Yesterday in the afternoon a big storm came in and started dumping corn snow followed by a vicious wind. Going up in the chair was like being blasted in the face with small, stinging shotgun pellets. I had to bury my face in the crook of my arm and bend over in the chair. It really hurt and was coming in sideways. Despite the storm, I decided to explore the eastern part of the resort and ended up at the bottom of the Iron Horse Quad after a long traverse in the blizzard. This is the area known as Moonlight Basin. It used to be a completely separate resort but was purchased some time ago by Big Sky and incorporated into their infrastructure. Just as I arrived at the Iron Horse lift there was an enormous crack of thunder, really ear splitting and they immediately closed the lift. In fact they closed every lift on the mountain. There was nothing for it but to head into Moonlight Lodge and sit in the lounge with all the other punters who immediately proceeded to get pissed. I waited and watched NFL football highlights on TV. Not so bad. About half an hour later the storm started to abate and I noticed the lift had started so I zoomed up Iron Hose as quick as I could. To my astonishment it was covered with about 4 inches of fresh snow and I had it completely to myself. I was completely alone up there making fresh tracks in the snow on the Powder River run. Then the wind dropped and it got very calm. A chipmunk ran out of the trees and seemed surprised to see me there. We stood looking at each other for awhile before he skipped away, with his tail bobbing. Beautiful moment. I never saw anyone else and the snow was fresh. I had three runs where the only person on the lift was me and the only tracks up there were mine. Complete stillness. Complete silence. 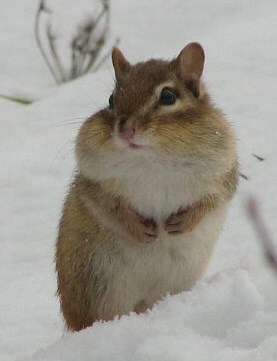 Just me and the chipmunk. It was one of those mountain experiences you never forget. Wish I’d had someone to share it with. Soon all the punters realised the lift was going and the storm had dropped and stumbled out of the pub. But for them it was too late. There were three sets of tracks up there. Powder River run on Iron Horse. Excellent. That was yesterday. After all the excitement, had a decent night’s sleep last night and decided to go and tackle this mountain in a serious way today. Knee was a bit stiff to start with and fluid is developing on the right hand side above the kneecap. I had a lot of oedema in that location after surgery. Never mind, it’s not hurting. 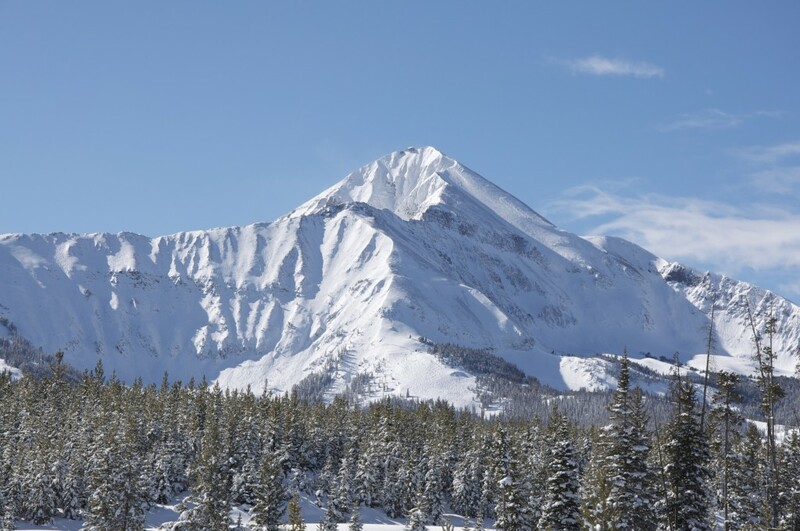 The majestic Lone Peak which dominates the Big Sky resort in Montana. Lone Peak Basin is the bowl below the rock band running across from the left hand side of the photo. I spent countless hours here on the single black diamond runs coming off the rock band trying to get my confidence back. The double blacks from above the rock band, while tantalising are, at this stage, beyond me. Spent the morning on the Lone Tree Quad doing the single blacks into the Lone Peak Bowl. Got more and more confident as the morning wore on. 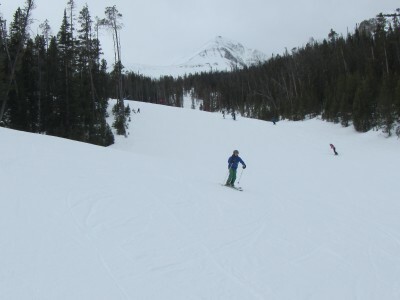 Went back over to Moonlight Basin again and did a couple of hours on the Elkhorn which is a beautiful long black run. Not game to tackle the double blacks yet, but I’m getting there, certainly getting to know this lovely, lonely, big mountain. Had to come in early as I was bidding over the phone for a property at Manly. Phil Thomas was on the phone for me but it went just a bit high. I was exhausted at the end of it and a bit disappointed as I’d done so much work on it. Maybe I should forget about Manly and buy a house up here in the mountains in Montana. It would certainly be cheaper. This is a copy of a letter sent to my personal trainer Belinda Van de Venn, at the Virgin Active Gym in Pitt St in Sydney, after my second day of skiing at Big Sky in Montana. Just got through day 2 so thought I should give you an update. Day 1 was interesting as it was like an exam day. I had a very capable female, American guide, Laura Herr, who was just back on the slopes after a broken fibula and ankle so she knew just what I was going through. She took it very slowly and we stuck to moderate runs. As you can imagine on the first run I was waiting for the pain to arrive but it didn’t. Thankfully. After about an hour the patella tendon just below my kneecap started to ache. Remember you said it would probably hurt. It wasn’t that painful or discomforting I just knew it was there. During the second hour the two tendons/muscles just above my knee started to ache but not for long. 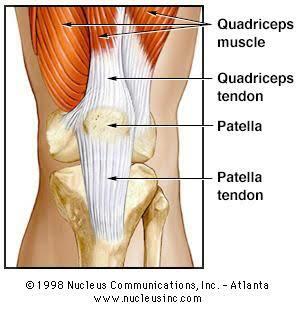 I think these are the quadriceps muscles shown in the picture above. The quadriceps tendon in the picture wasn’t hurting. The patella tendon was hurting just where the arrow is. Into the third hour neither was hurting much. Significantly nothing was hurting behind the kneecap or at the site of the plate. 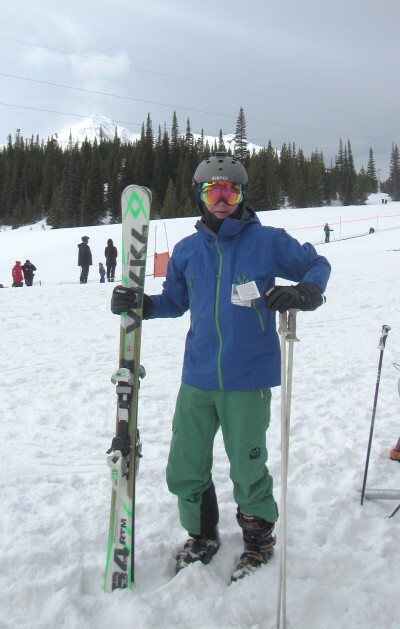 I ended up skiing for five hours. No residual pain at the end. Steady pace on medium slopes. No rampaging. Most significantly my quads,which are normally stuffed for the first couple of days, weren’t tired. At all. That’s a first for me. I put it down to all the exercises you gave me. Today was much the same. All the muscles around the knee, but not the knee itself, ached for about the first five minutes but then it went away. I skiied for four hours today without any pain at all. Late this afternoon, I spied from the chair, a beautiful looking run called The Bowl, a single black diamond coming off Lone Mountain, which is the dominant peak here. I’d only been on the greens and blues but thought, “Bugger it! Why not!” Went at a steady pace but didn’t stop top to bottom. Because it was steeper I had to lean out further and push harder on the broken leg. No reaction. I couldn’t feel the plate at all. I was very pleased. Anyway, much is now clear about the rehab you gave me. The flex and range of movement part I always got, ditto the strength part with the leg press and extension and flexion machines. What often puzzled me were all those exercises you said were to fire up the muscles around the knee – One legged balance on the Bosu ball, one legged dead lifts and that exercise standing sideways on one leg and holding the resistance against a Kinesis machine. I get all that now. Rehab from a broken leg isn’t about fixing bones. That’s probably over in the first eight weeks. It’s mending the buggered tendons and ligaments and getting them all working together that takes the time. Needless to say I’m enormously grateful for your efforts in my rehab. 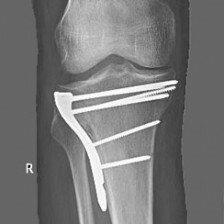 It’s one year and one week since surgery and I’m skiing comfortably down a black run. That’s all down to you. My daughters are also very appreciative of your skill and professionalism. If you want something to add to your rehab program, you might consider that routine I worked out on the bike – doing five sprints to 100 rpm at levels increasing progressively from nine to thirteen on a recumbent bike, all within a half hour. It’s really boring but it may also have helped with recovery. Anyway, so far so good. I’m telling everyone here about my miracle personal trainer back in Australia. Will be fully rampaging on the double blacks by the end of the week. Look out. Hope married life is going well – the first month is the hardest. The alarm went off and I was dead to the world. The first thought that entered my head was, “Well, here we go, the big day has arrived.” I staggered over to the widow and looked out. A grey day, not snowing, overcast. It looked brutal up there; hard as concrete. Still, I felt pretty good. I’d had about nine hours sleep and it really does knit up the ravelled sleeve of care. My sleeve, this morning, was sporting nary a hole or even a broken thread. Breakfasted over at the Huntley Lodge which wasn’t too bad. Found some muesli buried among the pancakes and syrup and donuts. Who eats donuts for breakfast? God, Americans eat a lot of junk, even for breakfast. A nation as rich as this and they all eat like peasants, albeit peasants with a sugar addiction. Coffee was undrinkable but I expect that now. Came back to my room and collected the myriad of gear, trying not to leave anything behind. It was a curious feeling stepping out into the cold wind once again, skies over my shoulder, hearing my boots crunch on the snow. “How may times have I done this?” I thought. It was very familiar. This was strangely reassuring. My guide turned out to be a diminutive, American woman, Laura Herr, in her 50’s. She reminded me of Louise Stevenson, same height and build but less cheeky and more respectful. She was very much into post-surgical rehab. 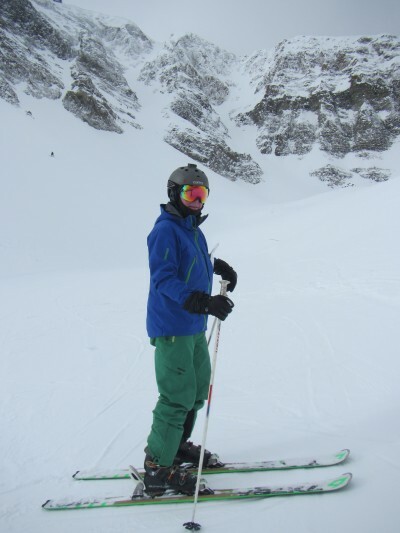 This is her first season back on the mountain after suffering a fractured fibula, broken ankle and torn ankle tendons. Run down by a snowboarder last winter. Screws in her ankle but no plate. When she described the accident I was amazed she wasn’t killed. We swapped a lot of war stories on the chair lift. Like me, she had been skiing continuously for 40 years without incident and then – bang – she cops a big one. She had the screws out before the season started so she could get a ski boot on. Little bit of residual pain on steep slopes and very apprehensive when she hears a snowboarder looming behind her. Understandably. Anyway we started up the Ramcharger Quad and onto an easy blue groomer called Pondersoa, which became the first slope I’ve skiied down since breaking my leg. Not bad. No pain so we kept at it. Ended up skiing solidly for 3 hours. I had an ache in the Patella tendon, just below my kneecap but Belinda had told me to expect this. No pain from the plate even when I leaned hard into a turn on that side. After Laura clocked off I had a quick coffee…Yuck, it would kill your old brown dog on a chain, and kept going. Became acquainted with mellow runs like Elk Park Ridge and Big Horn. They are only blues so I haven’t let the dog out yet, but they were fun to ski without any pain. 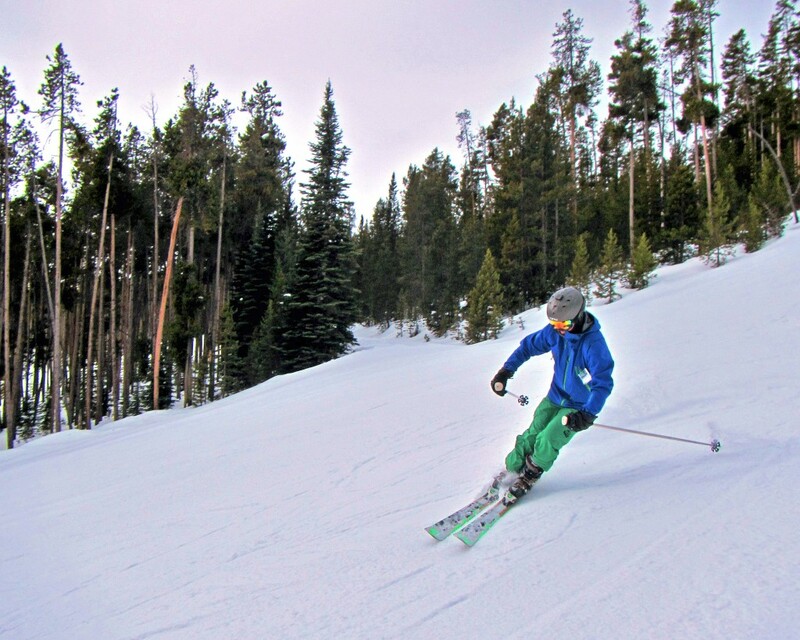 Surprised myself and kept going until 3pm – that’s 5 hours of skiing on the first day. Much more than I had expected and surprisingly, my quads weren’t sore which is unusual for a first day’s outing. Maybe I’m fitter than I thought or maybe Belinda’s exercises have done the trick. Either way I’ve realised that If I want to keep skiing I’ll be in the gym for the rest of my life. I also realise that I wouldn’t be here expect for Belinda – She who must be obeyed – was worth every cent I paid her.